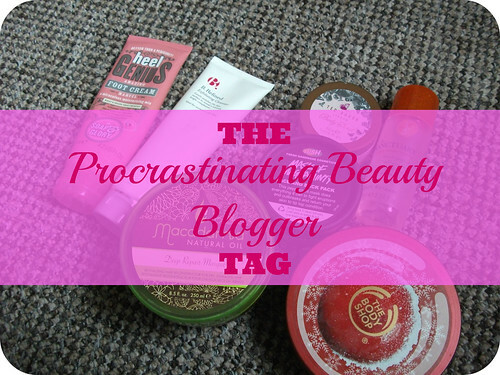 I have been tagged to complete The Procrastinating Beauty Blogger tag! Check out the rules, the questions, and my responses below. Thank you to the lovely Amiiee of It's Amiieeism for tagging me to do this post! It is, I actually really like washing my brushes, I find it so satisfying seeing all the dirt and make-up being washed out, and it's nice seeing them all lined up on the edge of my dresser to dry. It depends, if I'm at home then I take it off the same day it chips or at most the day after. If I was away then I could probably last three or four days with it before I had to track down some remover. I generally like to buy a replacement before I run out of essentials, and anything else I just pick up next time I'm in town. Things like foundation, though, I always have at least three or four so I'm never likely to actually run out, even if I finish one I've always got a couple more to go at! Touching my face! I know it's awful and I am trying to stop but I'm always doing it and half the time I don't even notice! I really am making an effort not to rest my face on my hands and so on, though, to see if it helps my skin at all. Washing up. I hate washing up. It's my boyfriend's job though, so I don't have to do it very often - thankfully! Not usually, but then I'm quite spontaneous and as long as I'm showered I can generally get ready to go out in about 15 or 20 minutes - hair, make-up and outfit! Pretty much - I don't have much spare cash at the moment as it is so I've been quite careful over the last couple of months, I did do a month's spending ban in about March I think it was and only slipped up a couple of times then. 9. How organised is your make-up and nail polish collection? Reasonably organised - all my nail polish is sorted into boxes by brand, although I would like a rack so I can see it all at a glance and see where everything is straight away. My make-up is sorted by type into a stacking box and some jars and dividers, which you can see in my Make-up Storage post. I have face products, lip sticks, eye products, then primers, lip glosses, mascaras and eyeliners in my pots and dividers. I know where everything is! I think about three weeks, either when I had no Internet or when life has just got in the way! I hope you've all enjoyed reading this post and getting to know a bit more about my beauty habits! Do let me know if you've answered these questions before, or if you'd like to answer them and I haven't tagged you then feel free to do so! What's your most-put-off beauty task? Remember to check out this month's Featured Blogger, Sophie Jane! My most put off beauty task would be washing brushes. I do like to see how they get clean and all the dirt is coming out, but it takes me some time to get started with it. This was really interesting to read! I used to have an awful face-touching habit, but I seem to have got over it over the years — probably because my neat freak streak won over, and the less I touch my face, the longer it feels clean. Your makeup storage before and after is inspiring me to finally sort through my jewelry shelf. Maybe I'll get to that today... maybe. Thank you for the tag, so sorry I'm so slow at responding, I had it written down on my little list :) Chipped nail polish is a huge bug bare of mine, I have to sort it out asap...so sad!